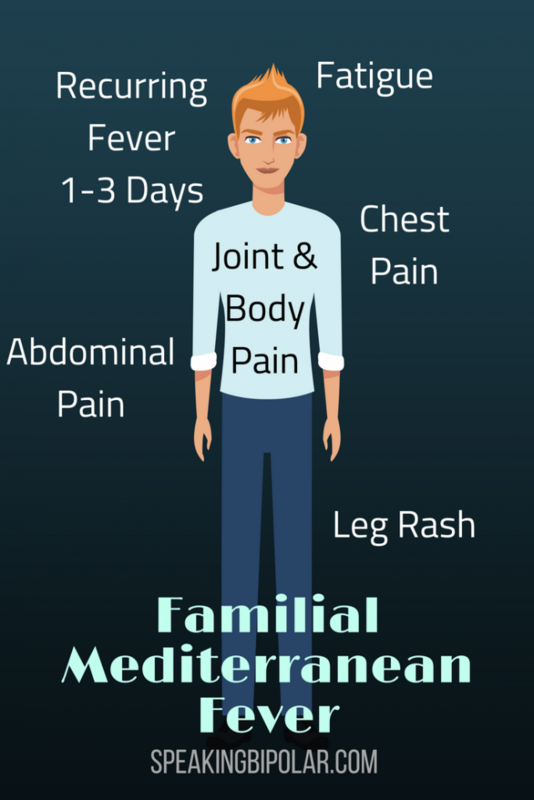 Familial Mediterranean Fever – What is it? It is insidious and relentless. Stress and anxiety make it worse, and that creates more stress and anxiety. Very few people, doctors included, have even heard of it. What is it? 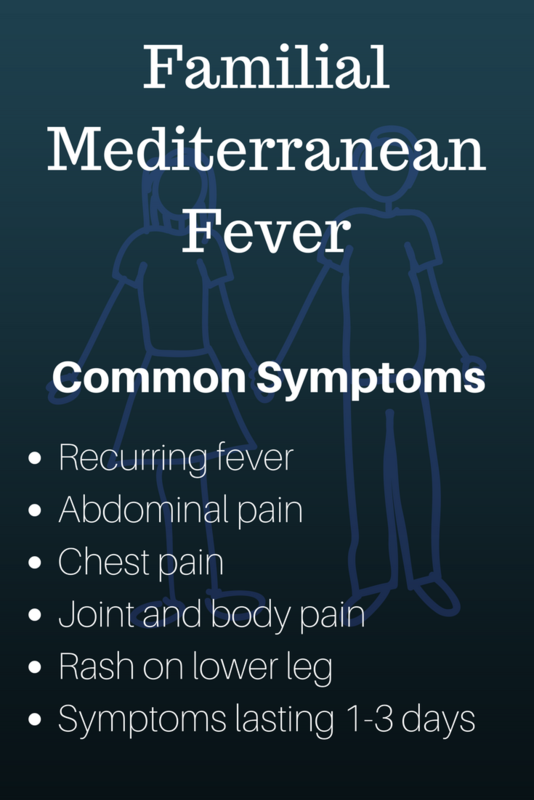 Familial Mediterranean Fever (FMF). Likely you have never heard of it either. Disclaimer: The writer of this article is not a medical professional. While links will be provided to authoritative sources, this article primarily describes the experience of the writer. If you think you may have FMF, you should discuss the possibility and any symptoms with your doctor. Why would I want to post about FMF on a website geared toward mental health advocacy? For two reasons. One, there is very little information available about FMF. Two, it is a condition that I endure. 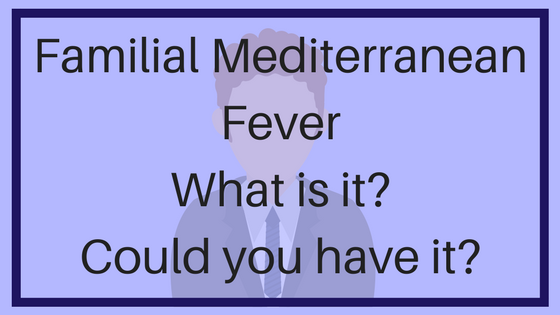 The first question I always get when I tell someone I have FMF is, “When were you in the Mediterranean?” So, let me start by saying this is not a disease you catch. The name arises from the fact that it is most prevalent in the Mediterranean area. 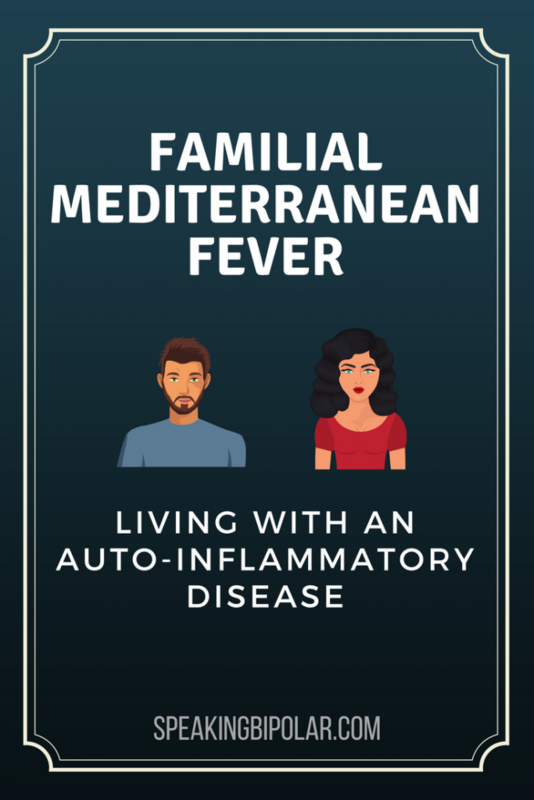 Familial Mediterranean Fever is a hereditary autoinflammatory disease characterized by acute inflammation and recurring fever. Inflammation may affect the lining of the abdomen, lungs, and joints. Less frequently, the membrane covering the brain and spinal cord or the lining around the heart may be affected. Unexplained pain in the abdomen. High inflammation markers in blood tests. Generalized body and joint pain. Skin rashes affecting the lower legs. Additional information available on WebMD by clicking this line. This line will take you to information from the American College of Rheumatology. For me, the stomach pain was so severe that often I could not leave the house. There were times I couldn’t even sit up. Sleep was near impossible, leaving me constantly exhausted and groggy. The fever was ever present. Usually ranging from 99.0-100.5 F but at times higher. My normal temperature is 97.6. Before I was diagnosed, I experienced the fever virtually every day. The fever brings on additional pain with it and makes me feel cold most of the time. Episodes of the disease, called attacks, can last from 2-7 days. Most frequently they last 2-3 days. Dizziness is a constant companion in my experience, but this could be a result of the pain and not FMF. Diagnosing FMF is relatively simple. There is a genetic test that is now FDA approved. The diagnosis is confirmed by a mutation evident in the MEFV gene. Even though diagnosing FMF has become easier, it generally takes a very long time to be diagnosed. Many doctors have never heard of FMF. In fact, none of my doctors, including the internist that ultimately diagnosed me, had ever heard of FMF before seeing me. That meant I spent years seeing doctors of various specialties, enduring test after test, and spending thousands of dollars. Every test came back normal. I started to believe that the pain and fever were only in my head. However, blood tests routinely revealed high inflammation markers. Many doctors will feel it is important to rule out everything else before even considering FMF. Several patients have reported how they had their appendix or gallbladder removed before receiving an accurate diagnosis. FMF is generally a hereditary disorder caused by receiving a recessive gene from both parents. I say “generally” because no one in my family has any signs or symptoms of the disease. One study I read (I will add a link when I find it again) stated that up to 15% of new cases had no family background. The most common treatment for FMF is colchicine, the same medicine frequently prescribed for gout. In many patients, colchicine is able to stop or greatly reduce the number of attacks. I have not been so lucky. Colchicine has done a lot to decrease the amount of abdominal pain I experience, but I still typically have an attack every week. During a bad attack, the pain is so severe that even walking becomes difficult. Happily, I do not have as many severe attacks now that I am taking colchicine daily. Online I have been able to connect with a few other FMF patients. A common thread in all our experiences is how greatly the disease can limit a normal life. One single mom recently posted how her daughter is suffering from the illness and has spent much time away from school and in the hospital. The daughter is only 14 years old. My heart breaks for her. The disease can be devasting, but life does not have to stop. Learning to pace yourself and to rest when you need to can reduce the frequency and intensity of attacks. Proper nutrition and low impact exercise are equally important. FMF forced me to quit my regular job and find options I could do from home. That has helped me a lot. The freelance work I do now is not based around punching a clock. If I need to spend a day or part of it in bed, the work is still there when I feel stronger. Most things are an effort for me, whether it is working in my yard or spending time with friends. Finding a balance is a constant struggle. I’ve learned repeatedly, and the hard way, that pushing myself when I am already starting an attack only makes the attack more severe. But I keep going. I will not be kept down. Please share this post with others and on social media. Do you or a loved one have FMF? Please share your experience in the comments. Wendy, I am so sorry you have suffered so much. Chronic illness is definitely not for wimps. I did look, and there are several CVID support groups on Facebook. I get a lot of good info from my FMF groups. Just a thought. Thanks for sharing your experience! Thanks for looking Scott. It may help. I appreciate your help. Scott, I thought I would let you know I checked out the CVID support groups on FB and applied through the screening process on one (it basically a formality because I meet the criteria I suppose) and should hear back from the admins to group some time soon. Thanks for letting me know about the groups. Wendy. That’s great! I hope you find the support and encouragement you’ve been looking for. We can get through this with warriors beside us.